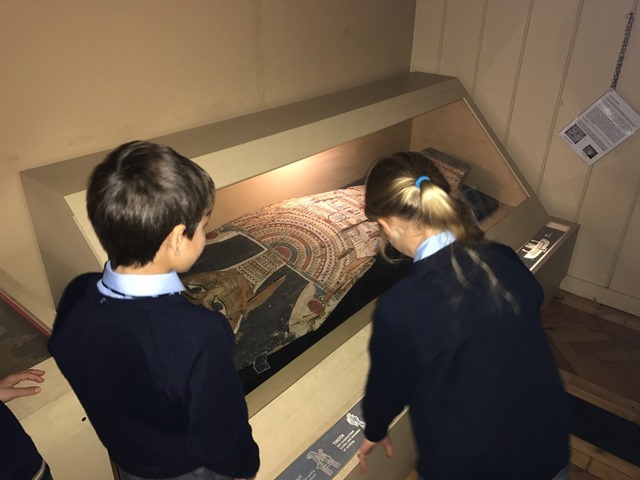 Form 1 went on an exciting trip to Haslemere museum as part of their Ancient Egyptian studies. First they participated in a mummification workshop led by Kay, where they learnt all about removal of the internal organs and storage in canopic jars. 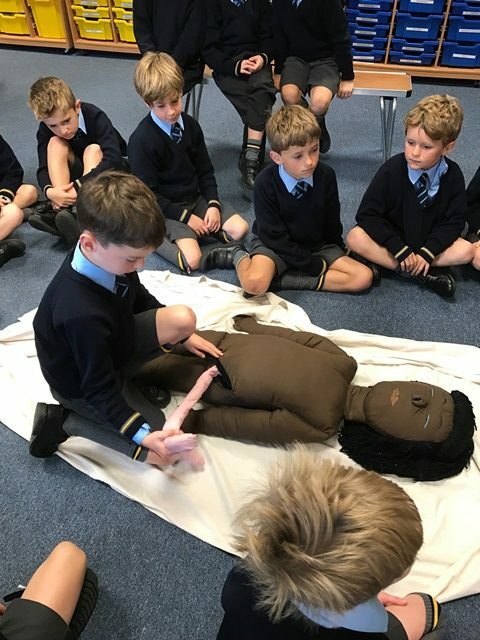 Some pupils were even fortunate (?!) enough to be chosen to help Kay remove these organs from the museum’s resident body, ‘Suty-em-wia’ (Suty for short). There were oohs and aaahs of disgust as Martha pulled the brain out of Suty’s nose! 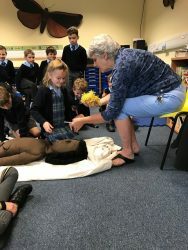 Freddie knew that the brain was then fed to the cat! Yuck! Because happy cats = happy gods and happy gods = kindness to the people. Zoe knew that Bastet was the name of the cat goddess. 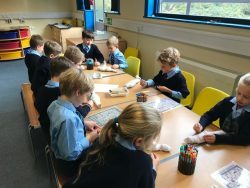 The children learnt that the Ancient Egyptians used Obsidian rock (minecraft!) to make a knife tool with which to cut a slit in the body in order to remove the organs. 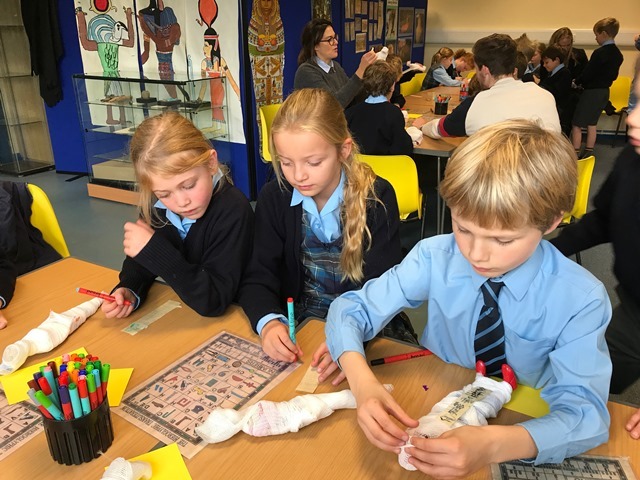 Henry La volunteered to remove the intestines and used his imagination to embalm them before putting them into the canopic jar. 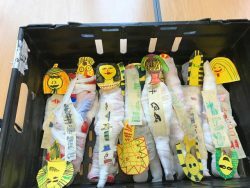 The canopic jars all have heads of the sons of Horus, the falcon-headed god. 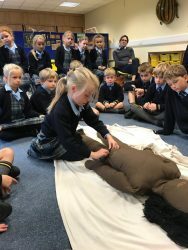 Kay explained the importance of covering the body in natron for 40 days to preserve it. The children learnt that the heart would be put back inside the body before the body was sewn up and the wrapped in linen bandages. 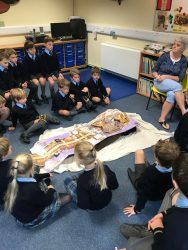 They discussed special things that would have been buried with the dead; Kay told them that archaeologists have even found pots of Honey in some tombs which are thousands of years old but still edible – how amazing! Later on, the children increased their Egyptian knowledge by exploring self-led activities; they investigated x-Rays of mummies, drew Egyptian artefacts, discovered more about Shabti (slaves made from stone) and tested their brains by deciphered hieroglyphs. 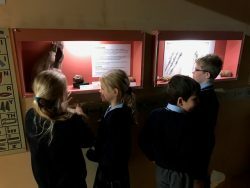 Going into the gallery to see the real ‘Mummy’ was very exciting! The children worked out that this person was not a pharaoh as they didn’t have a beard and their arms were not crossed before mummification, and also that they were a man because the face on his sarcophagus was a reddy-brown colour. 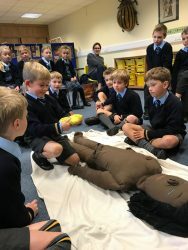 After lunch came the highlight of the visit – the chance to mummify a toy! 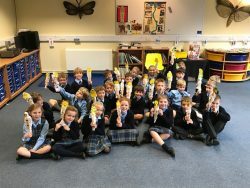 Armed with 25 Barbies and Action men, Form 1 followed the instructions to wrap their toys in linen bandages. 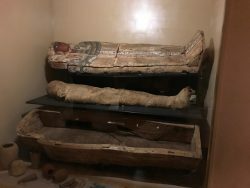 Following this, they decorated death masks. It was quite tricky but great fun was had by all.